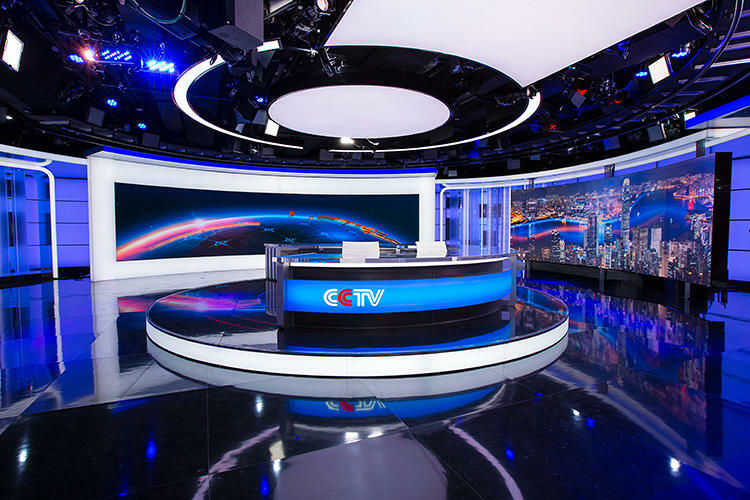 Chinese broadcaster CCTV has debuted a series of new sets that buck the American trend of more straight angles in favor of gentle, elegant curves and concentric rings. The sets, designed by Jack Morton, are packed with pricey ultra high resolution video panels that gives them stunning clarity and brightness. The panels use pixels that are only 2.5mm across — compare that to the 10 to 15mm pixels found on the units typically used for concerts and corporate events. 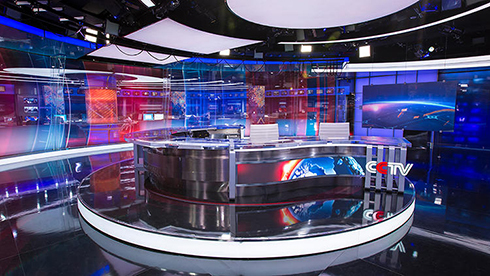 The main set, which overlooks the newsroom, features a large anchor desk with circular elements mounted above. One background is a massive LED video wall surrounded by a sleek backlit frame. Next to this, a freestanding video wall is situated in front of a curved wall decked out with backlit elements that snake up from the floor and curve to become parallel to the floor as well as translucent panels. 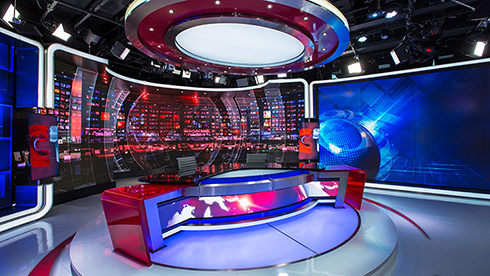 The horseshoe shaped anchor desk, meanwhile, is designed to be used from multiple angles, each with its own look and feel — one side is sleeker with color changing LED backlit panels while the other is a bit more ornate with a sleek metal finish, video panels and vertical metal toned bars at one end. 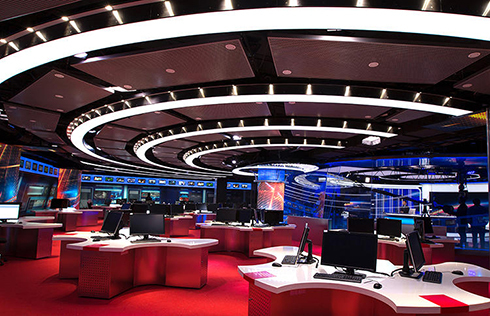 The circular studio overlooks a newsroom where 70 people work. Special semi-transparent panels with colored graphical elements give depth to the newsroom view while also providing a noise barrier. The newsroom continues the circular theme with internally lit and metal rings mounted from the ceiling. The newsroom also boasts columns fronted with video panels and backlit headers. Staffers sit at uniquely shaped pods. The project also included additional sets, all of which include the curved and ring-shaped elements, though some of these sets do make use of more right angles than the newsroom area. 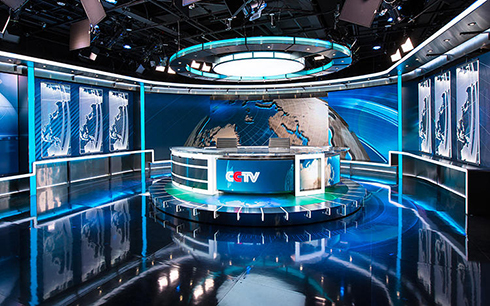 For example, the single anchor set shown above does include curved walls but portions of the set, including the right walls, column and anchor desk use sharper right angles. However, the circular theme is definitely evident with the internally lit ceiling fixtures. 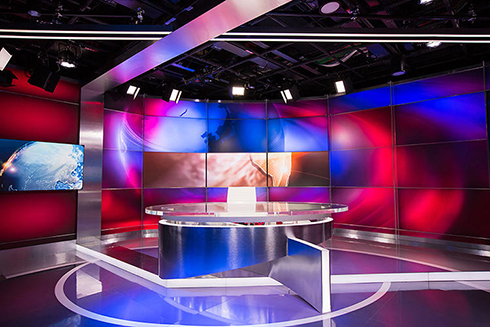 The straight angles were used effectively, however, in this set to really draw the eye to the anchor desk, in particular the sharp corner that extends from the top of the desk, the L-shaped video panel and riser. Another set, meanwhile, maintains the circular design theme with a circular header element and anchor desk. The wall directly behind the anchor desk is curved as well, but the rest of the set uses decidedly straighter angles. The set above features the same internally lit frames found on the main set and also boasts a flying saucer element. Its main background is a gently curving control room design that’s overlayed with radiating glass-like shapes. A video wall on the side of the set is does eschew the curved design. This set includes a gently curved video wall that is intersected by several straight angles, which, again, do an excellent job of drawing the eye into the environment. 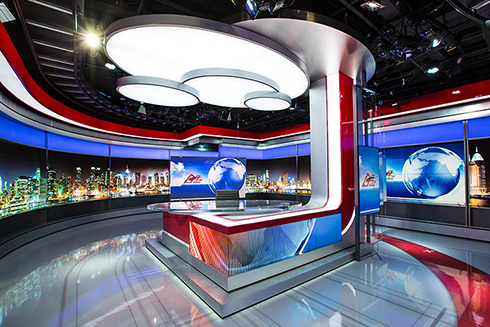 The thicker upside down L-shaped straight element that extends up from the floor and over the anchor desk boasts a metallic surface that subtly reflects the light given off by the on-set graphics, while two skinnier, internally lit lines in the ceiling mirror the riser on the floor and frame out the entire set.